Looking across the Vltava at St. Vitus' Cathedral on the hill. 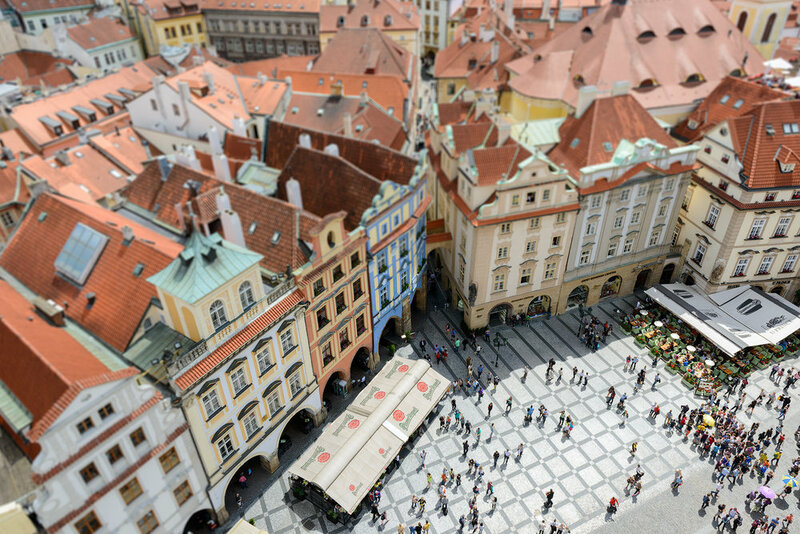 We'd heard several conflicting reports about whether Prague was worth visiting.. Stories of wonderful architecture and beautiful areas to explore....somewhat countered with tales of 'Stag & Hen' parties of biblical proportion! Despite the latter, the former seemed to be in the majority, keeping Prague very much on the list of 'must visit' destinations! When visiting a city for the first time..I prefer not to do any research into established photo spots so that I can just enjoy the place and shoot things that I think might work. I accept that this is not necessarily the most productive way of making the most out of a new location but it allows me to wander freely without concern for visiting a particular area or landmark. The one area I do research quite extensively is the accommodation and we duly chose our particular hotel based on excellent reviews and ease of walking both to the bridge and the Old Town square. My booking of a 'river view' room was met with a stereo rendition of 'Wow!' from both Di & I upon entering as it was huge (5-a-side anyone?) with a lovely view of the traditional property opposite and the river winding it's way off to the left....perfect! However, what none of the reviews or 'write-ups' had mentioned was that the 'traditional' property opposite was home to "Europe's 2nd largest night club"...a fact that continued to escape us until proceedings kicked off at 1am with a bass drum beat that could best be described as 'rib breaking'...the fact that it was able to make the crockery on our 'tea & coffee' tray physically jump was both fascinating and horrifying in equal measure! The cacophony continued to 5.30am whereupon I expected to see hordes of drunken revellers exiting said club (with ears bleeding)...but no, just the usual good natured behaviour that we were to witness for the rest of our stay! The complete lack of sleep did, however, result in a somewhat fraught exchange with the hotel reception later that morning which resulted in us moving to a room on the top floor overlooking the city on the opposite side of the hotel. If you're a lover of architecture then you're in for a treat with a mix of styles from Gothic to Postmodern...if Museums are your thing, then you have ten to choose from...alternatively, there are an array of theatres that seem to hold (mainly classical) concerts every day of the week...which, having attended a few, are quite excellent and allow you to also see the highly decorative interiors of said theatres. If I could offer a tip though...don't be tempted to buy the higher priced tickets as there are usually spaces still available that you can move into once the doors are closed. There are the usual open bus city tours which are grand and allow you to get your 'bearings' for further exploration on foot but don't miss the opportunity to see the city from the river from one of the many boat tours that traverse the Vltava on such a regular basis affording you views that would be impossible by any other means. Another must in terms of viewpoints and modes of travel is the funicular railway that runs from the Lesser Town up to the top of Petrin Hill which is home to the Petrin Observation Tower...a great vantage point with a long lens. This is by no means an exhaustive list...instead, it is intended to be a starting point for any research you may wish to do for yourself prior to visiting, or even whilst you're there. So, in summary, if you've been thinking about a city break and had any doubts about Prague being an option, be aware that it ranked 6th in the world for recommended destinations by TripAdvisor in 2016 and only London, Paris & Rome have more visitors in Europe...they're not going without good reason!!! Charles Bridge stays pretty busy all day...this is 10pm! However..even being up really early is no guarantee of having the bridge to yourself...this is 4.30am and folk are starting to come home from the bars. Banter was always jovial and often hilarious! I think she was going for the 'Bolt' stance...but the alcohol was getting in the way! The vast majority of the Scottish coastline is jaw droppingly beautiful but I think it is fair to say that the West Coast probably draws more admirers and photographers than either of it's Northern or Eastern siblings. 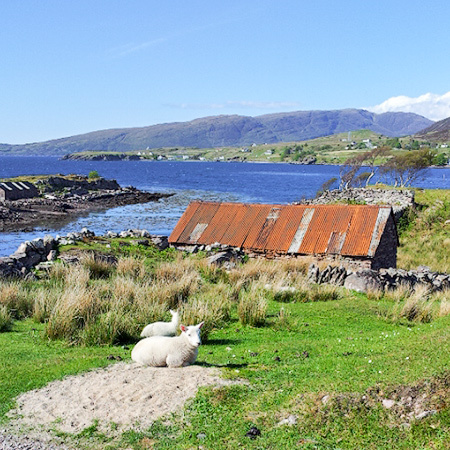 Whether you like photographing the landscape, exploring the landscape or just sitting back and enjoying the landscape, the West Coast of Scotland has to be one of the top destinations in the world...but where should you base yourself to make the most of this wonderful scenery? The view from the Bealach Ratagain looking over Loch Duich toward the Five Sisters of Kintail. Make no mistake though, that even limiting your area of exploration will still necessitate some serious mileage behind the wheel for the simple reason that beautiful countryside and an extensive road network do not make easy bedfellows. How many times have you listened to a national traffic bulletin to hear something like "There is a road closure on the A83 resulting in a 50 mile diversion via Oban & Inveraray! "...or something similar? Of course, all of this depends on your specific reasons for visiting and what it is you want to see. For example, you may want to just visit one of the many Inner or Outer Hebridean Islands and simply explore it for the entire duration of your stay...which is exactly what I would recommend you do. However, regardless of which island you decide to start with, and irrespective of how big or small it is I would say that you need at least a week to have any idea of what it has to offer and if you decide on somewhere like Skye (a favourite amongst photographers) this will barely scratch the surface. The purpose of this particular piece though, is to highlight a favourite base of mine from which I am able to reach Skye / Applecross / Torridon & Loch Maree etc. (Though I would rarely visit all of these during one visit up there!) Each of these locations offers a huge range of scenery, both seascape and landscape and, consequently, they also offer an equally huge range of photographic options. As you've no doubt gathered, the place in question is Plockton... Often referred to as the 'Jewel of the Highlands' and one of Scotland's prettiest villages but not without good reason. Having it's own micro-climate as a result of it's position falling under the path of the jet-stream and being on the east side of a peninsula in Loch Carron, it is one of the few places in Scotland where you will see palm trees...!!! Having just a couple of pubs/inns, four small stores and a very unintrusive take-away it might not be to everyone's taste...possibly being too quiet for some. For my wife and I, however, this is the very essence of it's charm...Throw into the mix a fantastic selection of food, real ales and whisky choices available at the village's three main eateries, a wide and varied range of accommodation to suit all budgets and views across the Loch that are simply stunning and you'd be hard pressed to find a better base from which to explore the area! However, even if photographic opportunities were not reason enough to visit, there are a huge number of walks, places to visit and activities to take part in...either straight out of the village itself or within 30minutes drive. But despite all of these wonderful places that are easily within striking distance of Plockton... it is the place itself that makes me want to base myself there. Admittedly, there are many villages that are nearby and are pretty enough such as Duirnish, Drumbuie and Erbusaig and the same accessibility to all of the aforementioned places is as true for them as it is for Plockton...But Plockton just has a charm that I cannot put my finger on...I can't say it's because of 'X' or 'Y'...maybe it's just a form of nostalgia from when I first visited with my then girlfriend..my now wife! Maybe it's because we have visited a few times and just know the place really well so that it has an air of familiarity...I just don't know! But whatever it is, I hope it doesn't lose it!!! Neist Point, Isle of Skye. I'm not what you would call a prolific 'blog/journal' writer...So here you will periodically find my thoughts on locations, the odd piece of kit or whatever project I'm currently working on!